The rip-off… excuse me, cash-in… wait, I mean homage, is staple of exploitation cinema. The popularity and cultural impact of Robocop (1987) is almost immeasurable. 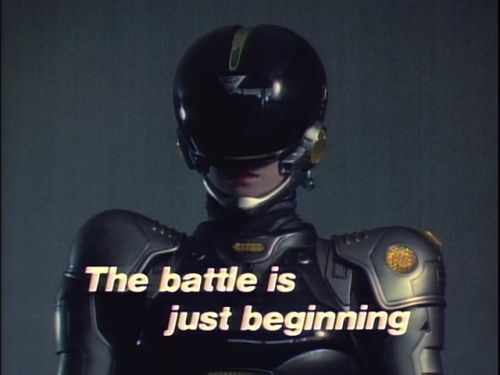 The iconography and way Robocop frames the excesses of the 1980s is pitch perfect and it’s no wonder that countless imitators appeared soon afterwards; e.g. R.O.T.O.R. (1987), The Vindicator (1986), The Demolitionist (1995). 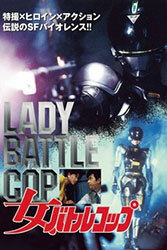 Lady Battle Cop fuses Robocop with the Japanese tokusatsu tradition of costumed heroes (Ultraman etc. ), and creates something uniquely weird in the process. 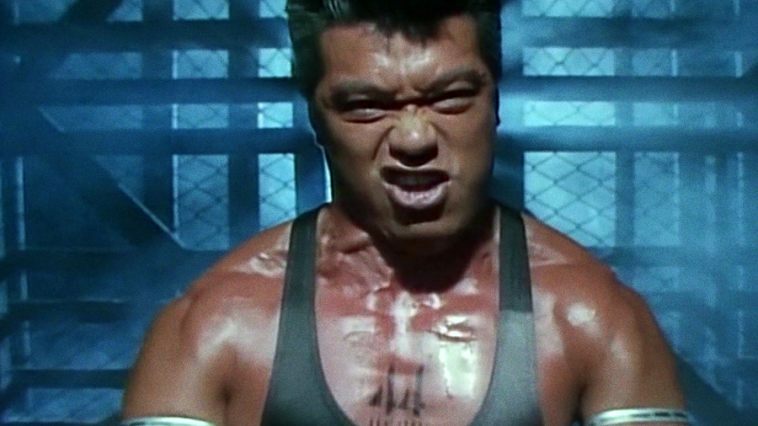 Neo Tokyo is under siege from an international crime syndicate called The Cartel. The Cartel employs a number of thugs including a powerful psychic named Amadeus. The Cartel’s hit squad takes out a scientist and seemingly kills his girlfriend, a notable tennis player, in the process. A few months later, the scientist’s friend, a cop named Sanjo, discovers a feminine looking cyborg is stalking the streets of Neo Tokyo with an eye on destroying The Cartel. Amadeus while watching Robocop 3. To say Lady Battle Cop is quirky is underselling it. For starters, our hero is a professional tennis player, something which seems to have no bearing on the plot, but does provide a song lyric for the ages: “Woman are made for tennis.” Lady Battle Cop is equipped with a leg holster, a rocket launcher in her wrist, and of course, hydraulic high heels. Despite all this, she pales next to her arch-foe, Amadeus, a grimacing maniac who possesses psychic powers, but only when he doing a ridiculous pose. Amadeus blows everyone off the screen every time he appears, and the movie uses him liberally. Perhaps the most frustrating thing about Lady Battle Cop is that it never feels like she gets the upper hand on her foes. Most of the fights consist of her getting kicked around and shot for the majority of the time, and then only through luck, does she dispatch an enemy. If she were presented as a hard luck hero out of their their depth, like say, John McClane from Die Hard (1988), this would make sense, but the movie props her up as an stoppable force of cyborg vengeance. Even low-level flunkies from The Cartel give her a lot of trouble. Things people say when trying to hunt down a VHS copy of this movie. One thing that Lady Battle Cop does successfully bring over from Robocop, is that film’s mean streak. Although not as graphically violent as that film, Lady Battle Cop has no qualms about killing virtually anyone who appears on screen. Rooms full of scientists, innocent bystanders, and even seemingly safe supporting characters are susceptible to a hail of bullets. Yet, this high body count never makes the movie feel grim. Lady Battle Cop makes a number of odd acting and musical choices to alter its path from just being another Robocop clone. It is violent and mean, but still somehow tonally light as a feather. Lady Battle Cop is definitely worth the time to seek out and enjoy. Thankfully the film exists in it's entirety on YouTube, so here's your chance to find out if women are made for tennis.